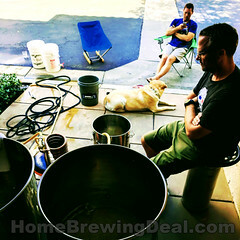 Homebrewing or home beer brewing is quickly becoming one of America’s fastest growing hobbies! 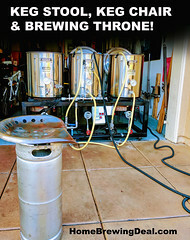 With new fledgling home brewers trying to find out where to begin, I figured I would build a resource that could help them have fun brewing, allow them to make great beer at home and at the same time save them some money in the process. So lets get started. There are a few things that you are going to need to make beer at home. Thankfully most of the big online homebrew supply stores create both homebrewing equipment kits and homebrewing beer recipe kits. Together those two homebrew kits will basically provide you with everything you need to brew great beer at home. One quick thing that we need to touch on before you purchase your home brewing equipment and beer ingredient kit. There are a few different methods of beer brewing for homebrewers. The first is known as extract beer brewing, where you brew with malt extracts. The other two methods are all grain homebrewing and brew in a bag, where you extract the malt sugars from the grains yourself. If you are new to homebrewing, I recommend that you start with the extract method of homebrewing as it is less complicated and three are less mistakes to be made and less equipment to buy. Once you decide if home beer brewing is a hobby you would like to continue with, them move up to all grain brewing and you will be able to use much of your extract brewing equipment in the all grain brewing process. You have several choices when it comes to home brewing equipment kits to make your first batch of beer. Some come with just the basics, while others come with everything you will need from a beer brewing kettle to boil your homebrew in, to a keg to store your beer in and serve your beer from. Your choice will basically come down to how much you want to initially invest in your new home beer brewing adventure. Here are a few homebrewing kits that I would recommend for different budgets. Includes: Bottle of Star San Sanitizer, Plastic Bottle Filler, Bag of Bottle Caps, Bottle Capper, Reusable Mesh Steeping Bags, Home Beermaking Book, Bottle Brush, Plastic Bucket Fermenter, Plastic Bottling & Sanitation Bucket, Airlock, Hydrometer, Hydrometer Jar, Vinyl Transfer Tubing and a thermometer. This deluxe homebrewing beer making kit includes a 5 gallon stainless steel brewing kettle, bottles, a blonde ale ingredient kit, brewing yeast and a sterile siphon starter. 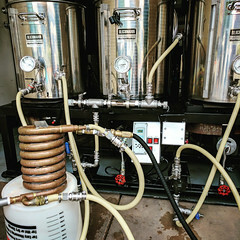 Lastly, this super deluxe home beer making system includes all of the bells and whistles, including an 8 gallon heavy duty brewing kettle with ball valve, beer keg system with included CO2 tank and a copper immersion wort chiller to help you cool down your wort for fermentation! This is an American Style Hefeweizen. This ale is a beer with a low-bitterness, mild taste, and is an ideal summertime beer that goes perfect with a lemon. This American wheat home beer making kit will produce approximately 5 gallons of beer. If you prefer a hoppy beer packed with flavor than this IPA home beer making kit is a great choice for you. This kit will make you 5 gallons of delicious IPA (India Pale Ale)! This beer is usually ready to drink in about 4 weeks! If you prefer a darker beer that is similar to Guinness, than this stout home beer making kit is a great choice. It is dark, rich and malty! This beer uses 1 lb of roasted barley and leave out the Chocolate and Black Patent found in many stouts. This provides for a very clean, precise dark malt flavor that is sure to please any stout lover! Once Your Home Brewing Kits Have Arrived! Once you have your home beer making equipment kit and your beer making ingredient kit all picked out, you are ready to start making beer! MoreBeer has a free shipping program and the items typically arrive in just a few days to most areas of the US, thanks to their 2 different shipping locations. When your items arrive, I recommend that you open them up and become familiar with them. 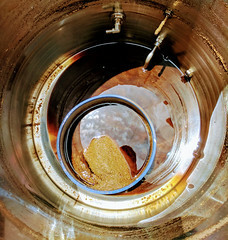 When you are ready to brew, you should plan on setting aside about 3 hours for the extract beer making process. It can be a great deal of fun and best of all, you get beer at the end of it! That is some great homebrew advice! Thanks for the write up. It is incredible how easy it has gotten to brew beer at home over the last 10 years. You can brew like the pros now in your own garage or kitchen!